Until recently, I had no idea how rare my sewing skills were, but I should have been clued in by the median age of the women buying fabric at the local craft store! Most are in their 50’s and 60’s. A few days ago, one of my readers, Janice, told me about stocking up sewing supplies and treadle machines. She explained, “Someday if times get really bad, I’ll be able to earn extra money by sewing clothes for people.” I think that’s a brilliant plan. Even if you have no idea how to sew, you should still begin stocking up on supplies. Hemming a pair of pants and sewing up a rip can be learned in just a few minutes, but if you don’t have the supplies, you’ll be left tracking down a Janet in your neighborhood! To get started, here is a list of essential supplies. Be sure to utilize Craigslist, Freecycle, and garage/estate sales. a variety of zippers, in different sizes and colors. Neutral colors are best. a variety of buttons, snaps, and hook & eye closures. Whenever you are throwing out old clothes cut off the buttons and zippers. polar fleece by the yard, when it’s on sale. This can be used for blankets and for sewing cold-weather clothing, but be aware that it is flammable and shouldn’t be used for children’s clothing. batting. Even if you’ve never made a quilt in your life, a supply of batting will allow you to add padding to clothing and other sewing projects. Good list. I would add interfacing and tracing pellon to copy multi size patterns with out cutting them. What public school moron decided that teaching kids life skills-such as sewing, cooking, and shop -was out dated and useless? In California we spend a fortune making kids as dumb as possible. Thank God, all of the women in my family valued sewing and passed it on. Remember- you can never have too many needles, straight pins, bobbins, or too much thread! Beyond clothing, there is the ability to create warm quilts, comforters, pillows, and black out curtains. The after Christmas sales should be great this year, Even if you have no use now, you will probably find a place for that 2 yards of cotton end piece for 98 cents. Also, when you sew, you can "re-purpose" other clothing or home supplies. Re-purposed good quality but out of date thrift store stuff is all the rage now. Spending $5 beats spending $100. A bit of skill in working with garment leather might be useful…don't forget buttonhole thread and gloving needles. I don't know what the shelf life of leather adhesive is. Save old jeans, they can be used for patching, the zippers can be reused as well as the buttons. Check out fabric at Savers, Good Will, Thrift shops or the close out sales at fabric stores. Check out your local quilt shop for quilting and sewing classes. I just purchased a beautiful, restored 7 drawer Singer 1916 (66) treadle for a song. A woman in my area of AZ has a hobby. She collects, refurbishes and sells at a song. I'll bring this one back north and have another one waiting for me to pick up and that one will head north with me the following year. Good article. I think many of us underestimate the value of a skill like sewing. Glad I took home ec (while it was available) in high school. Also, my mom is a master seamstress and many of her skills were pased on to me. I'll never be the master that she is, but having the basics is a skills that may serve me, and my family well, in a SHTF world. Even if I never barter, I can keep our clothes mended. I also enjoy quilting. My DH has encouraged me to have supplies on hand to work on projects when times get tough. I have plans for a HANDMADE king sized quilt. Something to keep my hands busy in the evenings. I have been slowly learning to sew over the past few years. I can make basic things like pajamas and blankets and plan to branch out to other patterns after the holidays. I have been finding amazing deals on sewing supplies at estate sales and thrift stores. A friend of mine has been teaching sewing classes to ladies at church and friends of her friends. She isn't advertising it, its all word of mouth. She has full classes each month. Its a good way for her to bring in some extra money for her family each month. She is a stay at home mom of 5 kids. Sewing is definitely worth learning, and it isn't that hard. 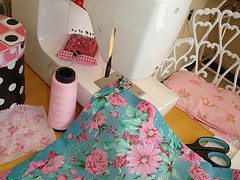 Most of the very simple patterns are easy to follow, and there are YouTube videos that will teach any beginner how to sew. I have been using youtube! Works great. I am currently working on a ruffle apron and the you tube videos are the only thing getting me through it! They have those on eBay. How cool! Thanks. I have bought a lot of sewing notions at Tuesday Morning. My Fiskars scissors have skull and crossbones all over them (no clue why they thought it was a good idea), but they cut just dandy and only cost $2. I have pins, needles, seamstress' chalk, a wrist-band pin cushion, thimble, several widths of elastic, etc etc etc that I have found on sale there. Very good information. I was taught growing up to save everything like you talked about with zippers and buttons. I inherited my grandmother’s collection of both and I use them and add to them. Thank you so much for sharing. My grandmother, along with many from her village had been rounded up and placed in work camps. She often told the story of her neighbor, who had been mending earlier that fateful day. Sadie had absently stuck the needle into the front of her shirt, expecting to return to her task. In a setting where your only belongings are the clothers on your back, that hidden needle became a treasures resource. I have a working treadle machine which is a duplicate of the one I learned to sew on. My mother did not have an electric sewing machine until after I started college in 1969. Even then, a treadle machine was seen as a dinosaur, but I really love the fact that it is made from metal parts, not plastic, and I can oil and adjust the machine myself. For someone putting together a basic sewing kit, sign up for the coupon newsletters with Hobby Lobby and JoAnn Fabrics. Hobby Lobby sends out a 40% off any regular priced (not sale priced) item. I use them to buy a spool of thread, a zipper, or a pattern. The prices of sewing notions has really gone up in the last few years. That 40% off coupon can also be used for fabric. JoAnn’s has similar coupons. I realized sticker shock when I went to buy buttons for a shirt I made my husband. I needed 11 matching buttons and they came to over $8.00. I went to Goodwill and bought a flannel-type shirt for $3.00 and cut the buttons off. I then used the shirt material to make covers for my Swiffer. It wouldn’t be a bad idea to stockpile blue cotton workshirt material and flannel, either. We’ll always need basic shirts and pajamas. I collect sewing machines, and have 9 “people powered” machines…8 treadles and 1 handcrank. The remainder of my 28 machines are pre-1960 electric machines. They all work, and I use them all. I figure that when SHTF, especially in an EMP event, those treadles will be very valuable! I have a spinning wheel, a beautiful 1917 Singer treadle machine in excellent condition (got for a steal, $75 and all the special feet and extra belt too), and finally got my mom’s Harrisville design 4 treadle, 4 harness floor model weaving loom. Now I am stocking up a little every week on thread, fiber, material, and a bunch of stuff. My mom/brother/sisters/brothers in law, think it is just to be “old fashioned”. But they will think different if something horrible happens. Better to have it and not need it than need it and not have it. Saving Blue jeans for sewing should be on this list, you can make easy bags out of the legs, reuse zipper and zaps, and patches, and even a blue jean quilt. Blue jean fabric is heavy and good for lots of uses. We save all of old good tough clothes and boots and socks and under ware just incase. I have lots of sewing stuff but I also buy yarn and keep lot of crochet hooks because I’d rather have crochet socks than no socks. I figure after I’ve re purposed all existing clothes and used all the material I have I will crochet. Another thing for the stock-up list is good quality patterns for basic clothing in a range of sizes. The two best companies to look at for these are Jalie ( http://www.jalie.com ) and kwik-sew, which can be found online and in stores. Both pattern companies print their patterns on real paper, not tissue, and both have understandable directions. I will go out of my way to get jalie patterns online because many of their patterns include a full range of sizes, from a little kids’ 2T to and adult’s 2X, so, for example, I can use the same boxer brief/long john pattern fot my 2yo, my 5yo, and my husband (and my little boys love having the same as Daddy) Also, they have a jeans pattern that gets rave reviews (I haven’t made it up yet) and even patterns for nursing bras and nursing-friendly shirts. Kwik-sew has a larger variety of patterns than jalie, but the sizes are the normal several per envelope. I have an old Singer that was my maternal grandmother’s. She had a motor put on it after the war (WWI possibly?). I would love to have it restored to a treadle machine for if and when there is no power, or I want to seriously reduce my need for power. Just have to figure out where to start looking! Oh, I’m also going to stockpile unbleached natural wools and cottons. I am a hand dyer and for me personally, this would allow me to have my own printed fabrics as well as have them the colors of my choice.